Combine tequila, lime and orange juices, garlic, red onion, salt and pepper. Whisk to combine and add to flank steak. Cover and place in fridge to marinate 4 to 6 hours. Serve warm with tortillas and salsa. Tequila is optional, substitute with lemon juice. *Grill 4 to 5 minutes on one side and 2 to 3 minutes on the other side for medium rare and let the meat rest for 5 minutes tented with foil. Carne asada was the first recipe I attempted on the grill. Worried I would set the neighborhood on fire I began small with a recipe I had seen my father grill many times. He would marinate the meat, preheat the grill and made sure to place the meat on the grill from left to right, an organized grill was easier to maintain. Ten minutes on each side and the carne was ready to be sliced and served. His specialty is still a family favorite. 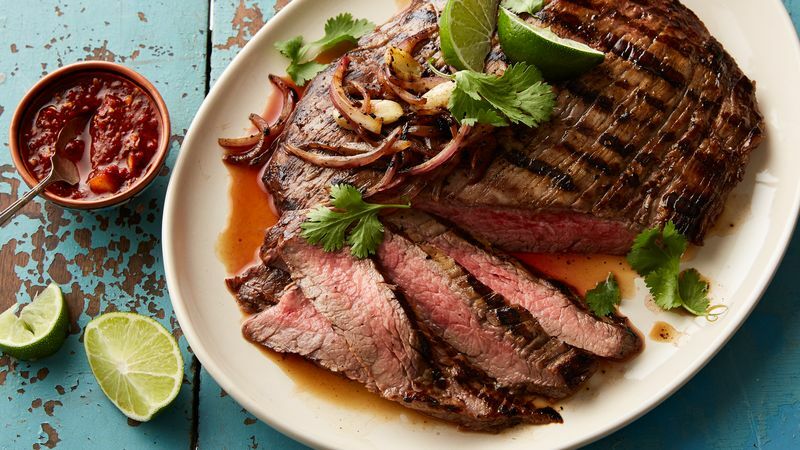 Carne asada is grilled thin slices of meat, which can be marinated in fresh citrus juices or simply seasoned with salt and pepper. Quickly grilled and typically used for tacos, burritos, nachos or served with rice and beans Carne asada is perfect for a family meal, fiesta or for company.